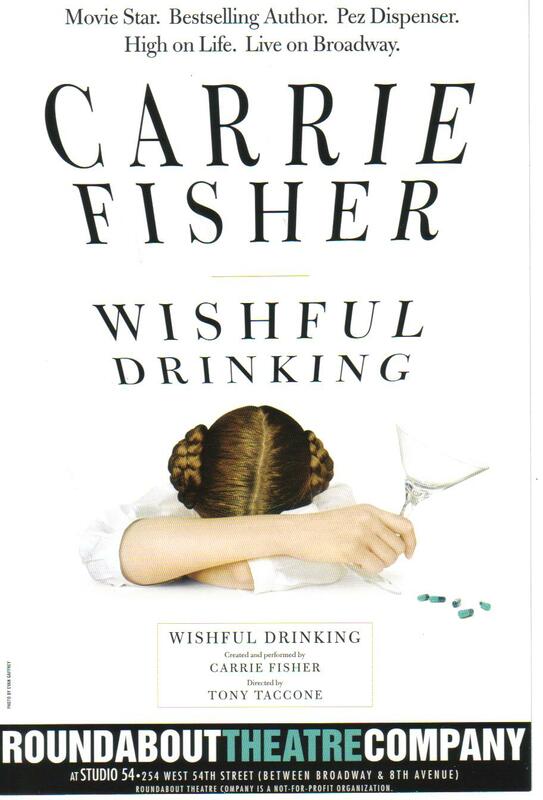 Carrie Fisher's one woman show is based on her 2008 book Wishful Drinking. I caught the show at Studio 54 on Friday night. The show is practically a motivational lecture on how to succeed at being crazy. 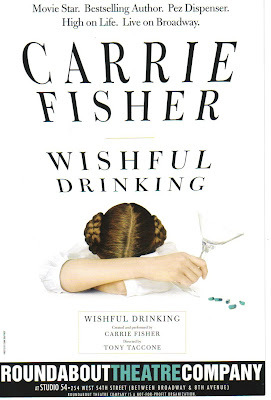 Carrie tells her story of being an alcoholic diagnosed with bipolor disorder* via a combination of stand-up comedy and autobiography. She shares her journey from living with her crazy celebrity parents to being thrown into one of the biggest movie phenomenons of all time as "Princess Leia" in Star Wars at age 19 to two divorces to motherhood to the death of a dear friend. She sings, sort of dances and spends time making friends with the audience. She makes dealing with these messy issues glittery fun - literally at times when she takes time to toss handfuls of glitter out into the audience. There's no fourth wall here as she treats us like we're just hanging out in her living room for an interactive conversation about her past, her family, and mental illness. She even asks for a male volunteer to have a little fun with a life-size Princess Leia doll. She doesn't spend time feeling sorry for herself and she's not asking for pity either, nor does she hold anything back. As she says, "If my life wasn't funny, it would just be true." Click here to watch her interview with CBS2 NY's Dana Tyler. The bonus of the evening was seeing Lily Tomlin in the audience. The other bonus was seeing the lady in the row in front of me take a pickle out of her purse and eat it at intermission. Now that's crazy. Wishful Drinking plays at Roundabout's Studio 54 through January 17th. Discount tickets are available via Broadwaybox.com. *Oh my gosh, she's Prettybelle! That pickle lady totally sounds like a stunt my mother would pull. Are you gonna eat that pickle? "I caught the show at Studio 54 on Friday night."